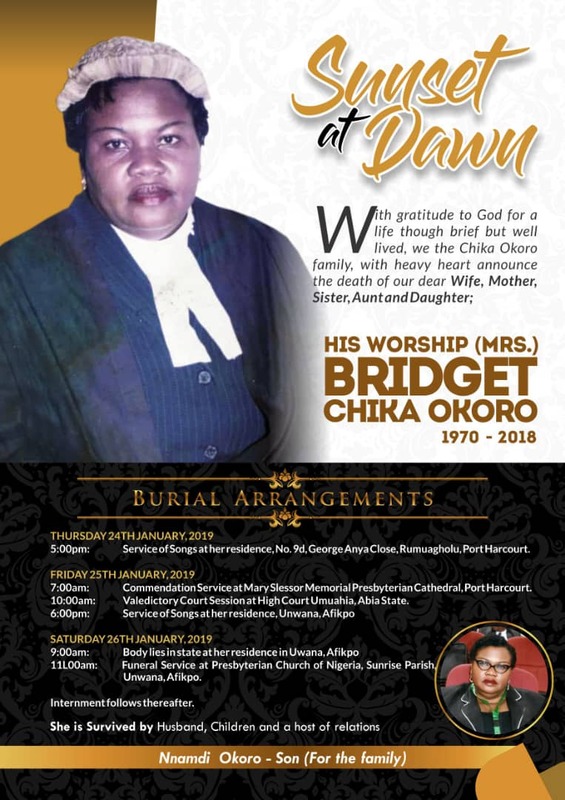 With a heavy hear but immense gratitude to God, for the Life of Mrs. Bridget Chika Okoro, wife of the board member representing South-East on the Board of the Nigeria Cricket Federation Mr Chika Okoro, the final burial arrangement have been announced by the family. 9:00 am: Commendation service at Mary Slessor Memorial Presbyterian Cathedral, Port harcourt. 11:00 am: Funeral Service at Presbyterian Church of Nigeria, Sunrise Parish, Unwana, Afikpo. No Replies to "Final Burial arrangements announced for HIS WORSHIP (Mrs.) Bridget Chika Okoro"